Would you ever pay $500 for a flight that has no set time for departure, lasts only 45 minutes, and is piloted by a barefoot captain? What if I added that the plane only holds 16 people and takes off and lands in water? If you are headed to an exotic resort in the Maldives then you have no choice but to come aboard the seaplane. While weather delays and other nonsense excuses given both by the airplane company and by the resorts make the journey of arriving in paradise frustrating, rest assured these planes have an excellent safety record. I arrived at the Conrad Rangali Maldives lounge at the seaport waiting to experience the dream of one of the most sought after destinations in the world, an oasis in the heart of the Indian Ocean. Across the water from the seaport was the populous capital island of Malé. Malé is only 2.239 sq. miles in size but has a population of over 100,000, making it one of the most densely populated places in the world. Visitors to the Maldives should stay on Malé for one night to rest up from what’s more than likely an arduous journey to the Maldives and also to take the first seaplane in the morning to their resort island. Otherwise, as is the case many times, the seaplane will be delayed and instead of lounging in your private bungalow, you will find yourself at the airport lounge calculating how much money you are losing each minute on a trip that, with or without points, still costs a small fortune. I was coming all the way from Colombo, Sri Lanka so no jet lag for me! After one night at a hostel, I took the ferry back to the seaport and luckily my seaplane was departing on time. 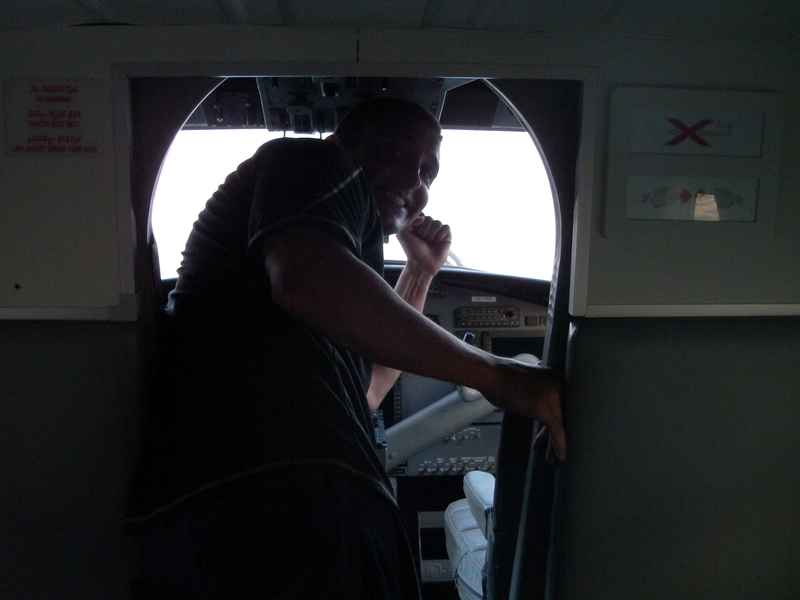 We received the safety instructions from our pilot and a set of earplugs which were unnecessary. Momentarily wondering if I had hopped on a Southwest Airlines 737, I was confused when the pilot announced that this would not be a direct flight. I wasn’t irritated by the news because I was on my way to paradise and I was able to participate twice in the takeoff and landing which was a nifty experience. Maldives is comprised of 26 atolls and 1,192 islands, making the journey the most scenic flight I have or will ever take. All passengers have their heads pressed to the window trying to capture some postcard photos while wondering what they did to deserve this. For most, staying at a private bungalow is the height of indulgence. Most bungalows walk right to the ocean and some even have Jacuzzis on the relaxing sun deck with only nature observing whatever you choose to do. However, for one individual that was not enough, so he chose to rent out three islands for himself for a month. Unfortunately, I was a few points short of a billion to do that. That distinction belonged to the Crown Prince of Saudi Arabia who spent $30,000,000 for a month long stay with his 100 bodyguards, floating hospital, and luxury yacht. Tourists who originally booked at the same resort were upset when their reservations were cancelled without notice. But they aren’t royalty! Your little goat herder makes your reservation look like a welfare case! And now back to my peasant seaplane flight. Crown Prince or not, it was a memorable experience.